If you experience a problem with JJ2+ (or even vanilla JJ2) where a controller (or similar device) seems to constantly be moving your character or mouse without your intent, please visit this thread for information about how you can help diagnose this problem. There is a problem: I downloaded HH18 and started the game, and the JJ2+ theme changed to Christmas Chronicles. I removed all the HH18 files, uninstalled and reinstalled JJ2+, and the theme is still that of Christmas Chronicles. It's the JJ2+ version from February 2018, so I'm sure it's not part of the patch. How do I revert the JJ2+ theme to the regular JJ2+ theme (the one where 1.23 got a picture of Jazz, Spaz and Devan in a cute style and 1.24 got one of Jazz, Spaz and Lori in an action movie style)? Try changing the [General]TitleScreen setting in your plus.ini file/s, which accepts the values "1.23", "1.23+", "TSF+", "XMAS", "vanilla" and "random" (default). However, only the title screen is fixed. The game menu is still holiday hare themed. That's because it's winter and J2O's background is snowing. So you're saying it will revert to normal when the spring season begins? I know it could sounds really lame, but Im trying really hard to find some way to play coop with someone. What I must do fort hosting online (could be even just LAN) coop game? JJ2+ supports coop mode for online servers. 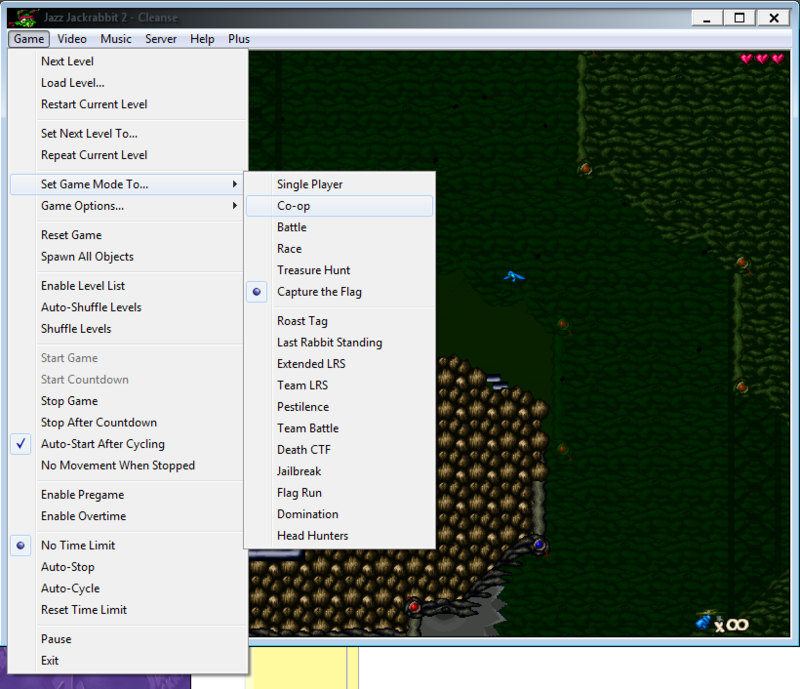 Just host your own game, type the "/coop" command, and cycle to the level of choice with "/c filename". Could you please be more specific? I only learned how to host "classical" game as battle (to be fair this thing is pretty user friendly), but how do I get to type commands. Where? Thanks in advance! Hello. Commands are typed into chat, which you can open by pressing T, and send using the enter key. When you're still getting started, it may be a better idea to instead use windowed mode for hosting a server. That way you gain access to the window menu, which provides you with a lot of options you can use for changing game settings. You can also switch between windowed and fullscreen mode as needed using alt+enter. The screenshot below shows how to change game mode to cooperative this way. And just to be clear I have version from GOG - secret files (with JJ2+). Thanks a lot for trying to help me! Did you download JJ2 and the Plus patch separately? That might be the issue since Plus is not directly compatible with the unpatched version from GOG, but in the Extras bar on the game's download page there's a version of JJ2 which has Plus preinstalled. Try installing again with that one, it shouldn't have any problem working. Installed it directly from gog with JJ plus. But I will try it again. OMG it worked!!! Thanks a lot! Who would have thought that 21 years old game would have such living community!